Now, we explored a bit of Dubrovnik in the afternoon. Climbing up steps to get this photo-taking point was very exhausting! The washing blew by breeze from the Adriatic Sea made this view very unique and interesting. I think because people do live their daily life here, Dubrovnik attract so many tourists and make the Old City more unique and interesting. It's like as if I wander into an medieval time. Dubrovnik excites curiosity like, "what am I going to find if I walk up to the end of this narrow street?" 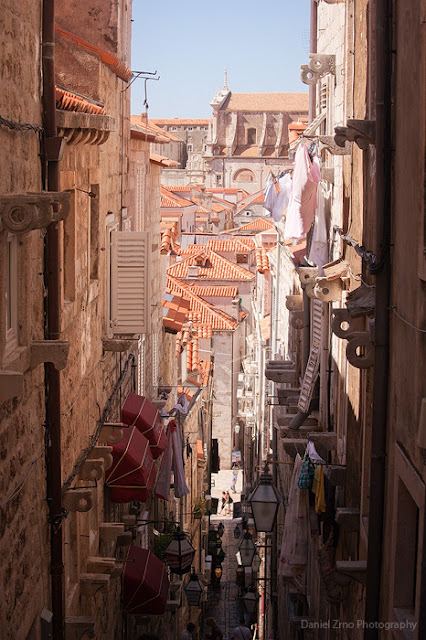 The strong Adriatic Sun touches the Cold City of Dubrovnik and reflects on the whity road surfaces and walls. Dubrovnik in the afternoon is very bright, and sometimes it was hard to even keep my eyes open! 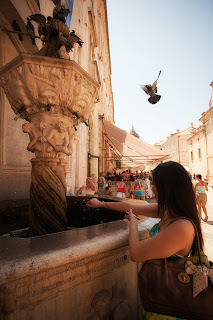 Still, I would recommend you to visit this charming Adriatic Old City from the early summer to the end of summer, or even til the beginning of autumn. The old building you see over there on the photo is Dominican Monastery. I encountered with people who played music in front of Sponza Palace (Palača Sponza). I think they played the baroque music, and it mixed very well with the medieval atmosphere of Dubrovnik. 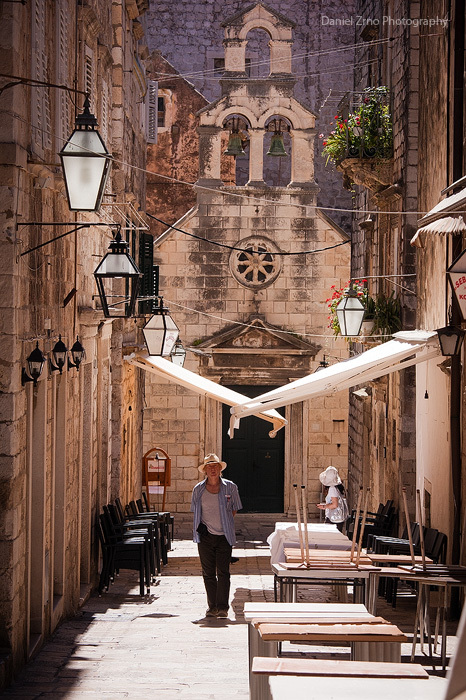 In Dubrovnik, you will see many people playing music (usually classical music) everywhere in summer. So, the city becomes more livelier and bustling. From mid July to the end of August (10 July to 25 Aug for this year), Dubrovnik hosts "Dubrovnik Summer Festival" full of cultural events such as music concerts, theatre performances, dance, art and so on. Here we come the market, which is located inside the City Walls. Compared to the Dolac market in Zagreb, this is much smaller, though. It seems like they sell veggies and fruits targeted more local people in the early morning, and int the afternoon, there are more shops selling souvenirs like honey, dry fig, lavender and so on. There, we were stopped by a shop-woman who speaks very good Japanese! She told us that she studied Japanese at a language school for 3 months. But, her Japanese is really good and I couldn't believe that she had learn so much in 3 months. There are fountains at the beginning and the end of Placa street: one is Big Onofrio Fountain, and the other one on the photo is Small Onofrio Fountain. The fountains supply cold drinkable water, so I saw some people fill their bottle with water from the fountain. This very cold water was great, especially after I walked a couple of hours under the strong sun. It was very refreshing! Now, we got to the Ｃｉｔｙ Port of Dubrovnik. Boats to Lokrum Island located 700m offshore and many short cruising tours depart from this port. It was amazing that water at the Port is relatively clean and I could see the bottom of the water. When you walk along the street of the Port to the end, you will find a swimming spot. Returned inside the City Walls again. This is Church of St. Blaise at Luža square. Inside the church was rather very simple compared to other churches in Dubrovnik. But, the sun shined through the stained glasses and lit the alter with beautiful colours, and made a very mysterious and sacred atmosphere inside the church. The church was built to consecrate to St. Blaise, who is the patron saint of Dubrovnik. He holds a model of the City of Dubrovnik showing the city before it was destroyed by the "Great Quake" in 1667. The statue of St. Blaise is also placed on the Pile Gate, and many other places in Dubrovnik., which tells us how important he is for Dubrovnik and how much he is loved by people in Dubrovnik. This is Cathedral located just behind the Church of St. Blaise. The inside of the church is also very simple and based on white colour. So, it was very bright and clean, on which "Assumption of Our Lady" painted by the famous Italian painter Tiziano stands out. It is also said that archaeological researcher found remnants of Byzantine church of 6th century when the Cathedral was restored. This findings prove that Dubrovnik exists before 6th century. So, Dubrovnik has very long history. We encountered with happy bride and groom in front of Lector's Palace. It seemed like the happy couple came all the way to Dubrovnik from Italy. Having a wedding ceremony and reception in this charming Old City of Dubrovnik is so romantic! Unfortunately, we already had our wedding in Zagreb (and in Japan! ), so we can't have another wedding here, but it would be awesome if I could have even wedding photo shoot in Dubrovnik.